The operation for Mac version VeryPDF CHM to PDF Converter is the same as that of Windows version. You may follow the instructions to use your VeryPDF CHM to PDF Converter for Mac. 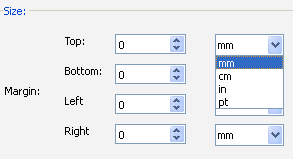 Click Setting in the tool bar in the main interface. When the Setting dialog box appear, you can set margins under Size. Four units are supported: millimetre (mm), centimetre (cm), inch (in) and point (pt). Click Setting in the main interface. When the Setting dialog box appears, click the arrow in the control box after Page Size under Size. Choose an option in the drop down list such as B5. Click Apply to close the Setting dialog box. Click the last option Custom in the drop down list. Type numbers in the edit boxes after Height and Width. Choose a unit in each control boxes. Click the arrow in the Orientation control box under Other Settings. Then, choose Portrait or Landscape from the drop down list. Under Other Settings in the Setting dialog box, in the Zoom edit box the default setting is 1, which means 100%. If you want to magnify or reduce the pages, you can change the number in the Zoom edit box. For example, if you want to zoom out the pages, you can type a number like 0.5 in the Zoom edit box. If you want to zoom in the pages, you can type a number like 2 in the Zoom edit box. To generate low quality PDF, you can click in the Low Quality check box under Other Settings. Note: The Low Quality check box cannot be used with Zoom eidt box at the same time. If you have a large amount of books to print after conversion, you may want to save your ink. In this case, you can click the check box before Grayscale to generate gray scale PDF files. Click the Choose button after the Output Folder edit box at the middle of the main interface. 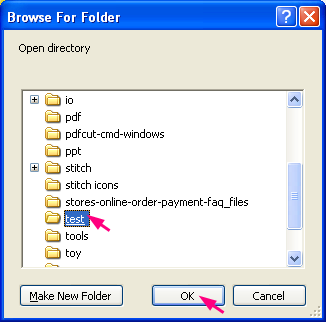 When the Browse For Folder dialog box appears, choose a folder and click OK.
Click the Start button in the tool bar to start the conversion.